European trade unionists are alarmed that despite the clear injustice inflicted on the people of Palestine, the European states, the European Union (EU) and representative institutions have failed to fulfil their legal duty to hold Israel accountable for its grave violations of international law. In particular, European trade unions are concerned about the ways the European Union and European governments are complicit in Israel’s violations of Palestinian workers’ rights. “While the EU criticizes some aspects of Israel’s policies, they continue to provide it with political, economic and military support” – said Barend Claessens from ACV/CSC Brussels, coordinator of European Trade Union Initiative for Justice in Palestine. A research that will be presented on May 18th in Barcelona at the Second Trade Union Seminar – Justice for Palestine! Ending European complicity in Israel’s violations of Palestinian workers’ rights will highlight complicity of the European Union, European governments and companies in the occupation of Palestine and the ways it is undermining decent work and violating Palestinian workers’ rights. 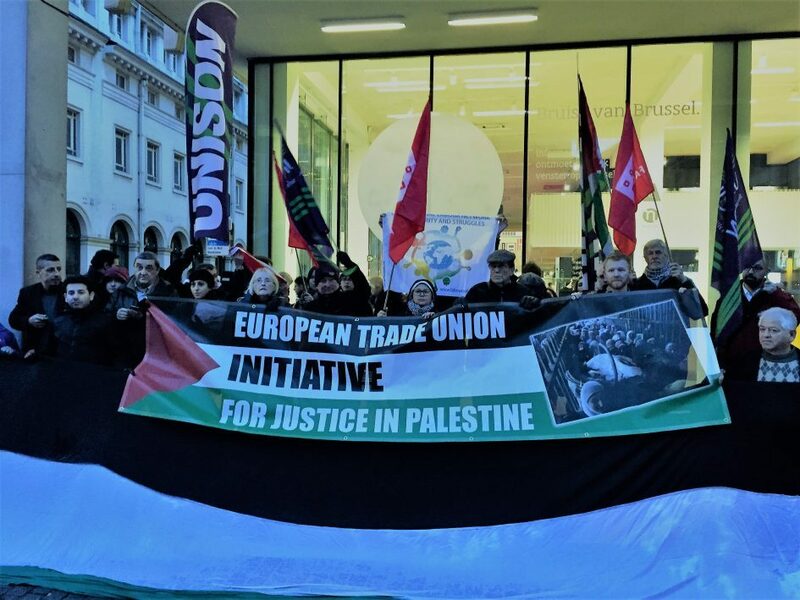 European Trade Union Initiative for Justice in Palestine, a coalition of 34 European trade union organisations representing 6 million workers, is arranging a special report with recommendations towards the European Institutions. According to trade unionists, Israel’s serious breaches of international law trigger legal obligations for the EU, Israel’s largest trade partner, and to its member states. A call from European trade unions towards the EU and European governments occurs at a time when a total of 108 Palestinians have been killed by Israeli soldiers during 7 weeks of the Great Return March protests in occupied Gaza, including eleven children, two journalists, and four people with disabilities. Approximately 4,000 people have also been injured, over 2,000 from live ammunition. “The failure of the international community to take action to ensure that Israel complies with international law has allowed Israel to continue its countless attacks on Palestinian civilians, including the recent killings of Palestinians in Gaza, with complete impunity” – said Saif Abukeshek from Intersindical Alternativa de Catalunya, a conference hosting union.